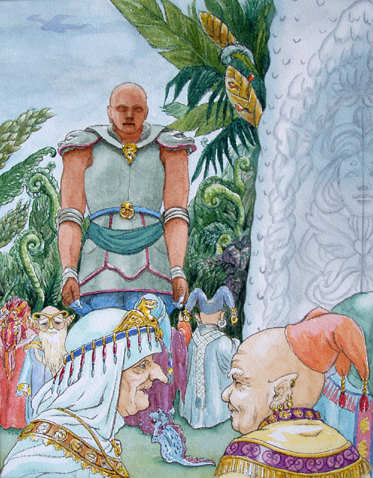 Golem was happy to assist the Fairies build their houses and other constructions, such as bridges. Though he looked somewhat like a naughty Goblin, the fairies found him a powerful and diligent worker. For the Dwarfs, Golem brought from the Tower strange tools and equipment the likes of which they had never seen. These tools proved very useful, and enabled the Dwarfs to learn the arts of blacksmithing. The Dwarfs were very good at this, and were soon making their own simple tools. As they hammered iron together, a Dwarf boy asked Golem, "Where are you from?" "I was created in the Tower." "Aha, but it seems there's nobody but you. Who built the Tower, then?" "They live on a distant planet." "How do they look? Can you show me?" "I could show you by allowing some of the creatures to grow here. The seeds of their species are stored in the Tower---but your chiefs will not give me permission to release them." One day a chief called Golem. "You have shown us that you can live and work peacefully with us. I heard you had seeds of the species which created you. If they have such an advanced intelligence, we guess they can get along with us in peace. Therefore, we give you our permission to plant the seeds of your creators." Golem said to the chiefs; "I have three important things to ask you"